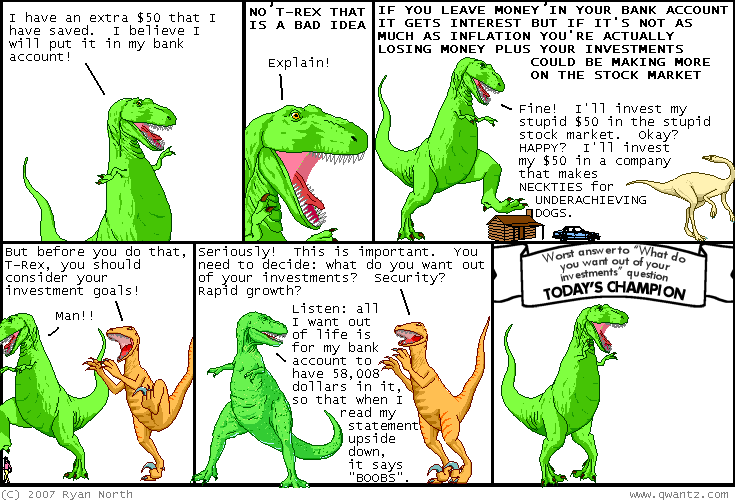 Dinosaur Comics - September 20th, 2007 - awesome fun times! –"It was three years before the Great War." September 20th, 2007: Hey, everyone who has ordered one of the new shirts! I've gotten a few emails wondering about shipping. The new shirts were pre-ordering, which lets me guage demand before I get the shirts printed, so that nobody ends up bankrupt. The shirts have been ordered and the "Failure is Just Success Rounded Down" are being shipped to us now, so you should begin to get those by early next week. "Problems" will be shipped at about that time too. "Take Boat" is a little delayed but should be shipping soon too! Feel free to email me if you have any questions, but if you got the little confirmation email from me, everything is in order. Sorry for the delay on these! One year ago today: t-rex knew that he wasn't that into skulls at all really, but he was too far in to turn back now.